Over at Bleeding Green Nation, Route36 had a nice video rewind, looking just at the Eagles run defense. He comes out of that exercise much more optimistic about the linebackers than when they went in, mostly based on their improvement over the course of the game. It's an interesting study, but I'm not convinced yet. First of all, assigning positive and negative grades to plays based on outcome seems quite arbitrary. There aren't many I disagree with, but it's odd when plays marked as "Chaney misses the tackle which would have allowed only 4 yards" is listed as a positive play for the defense. If you mark a few of those negative, then you're very quickly at the point where the Eagles are at equal good and bad plays. That doesn't seem like the makings of a good run defense to me. Furthermore, saying that all runs 5 yards or more are "negative" doesn't quite cut it. For example, 7 of the 10 plays marked negative actually allowed 10 yards or more. If we classify those as "super negative" plays for the defense, things don't look quite as rosy. Second, I don't really see the case for discounting the first quarter performance. A defense that has many poor plays is likely to give up some big runs, like the one they allowed to Steven Jackson. And as I intimated earlier in the week, it might be more appropriate to only look at the first half, since the second half quickly got away from the Rams. When the game was close, they were shredding the run defense. I'm sure a better team like the Falcons hopes to keep the game competitive and pound away. Third, we do all remember that Jackson got hurt early in the game, right? I'm not encouraged by the defense allowing worse than the league average on running plays to castoff backs like Cadillac Williams and Jerious Norwood. Finally, there's the matter of attributing credit and blame. Rewatching these plays only reinforces the notion in my mind that if the defensive line doesn't do something to stop the run, it's going to be a bad play. The vast majority of "positive" examples of run defense involve one or more defensive linemen making the stop or otherwise causing it. When the Rams got past the first line, the linebackers rarely did anything to stop the bleeding. In other words, the Rams "second level" rushing yards were still very high - a bad sign for the linebackers. Overall I'm still hopeful that the run defense and specifically the linebackers can improve, but I just don't think we saw enough last Sunday to tell us that process is already underway. 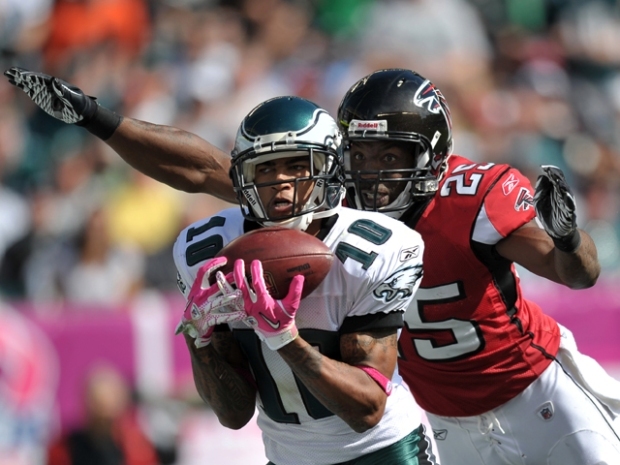 If the Eagles can limit Michael Turner this week, then we'll talk.